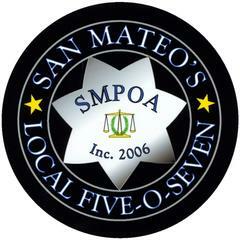 Last chance to get tix to our San Mateo Police Officers' Assoc. 10th Crab Feed & Casino Night! Deadline Noon this Monday. 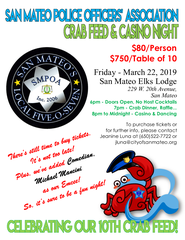 This weekend is your last chance to purchase tickets to the San Mateo Police Officers' Associations 10th Annual Crab Feed & Casino Night! We need to get a head count to the Elks come Monday, Noon, so make sure you contact Jeanine Luna at (650)522-7722 or jluna@cityofsanmateo.org to get yours before it's too late! 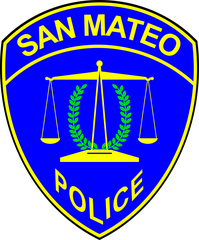 The event will be held this Friday, March 22nd at the San Mateo Elks Lodge (229 W. 209th Ave.) from 6pm-Midnight. Join us from 6-7pm for No-host cocktails, a silent sports memorabilia auction, and music. We'll head in for the all you can eat crab at 7pm. Additional dinner items include wine, salad, two types of pasta, antipasto platter, garlic bread, and of course dessert. During dinner, we have guest Emcee, Comedian Michael Mancini, who will assist the POA with calling out all of our wonderful raffle winners and will do a short comedy stint with dessert. Right about when dinner is winding down, we'll open up our Casino and kick-off our dance party. There will also be a photo booth for you to capture your memories of the night. All of this for just $80/person or tables of (10) are available for $750. This is a crab feed not to miss! We can't wait to hear from you! Leave Jeanine a message or drop her an email to reserve your space today! Deadline is 11:59am, THIS Monday! Grab some friends and join our Police Officers' Association for a great time!